The Foresters BIG Swim for Arthritis is the first event of its kind in Canada involving approximately 150 pools, from one coast, to another. This national swimming event is designed to increase awareness about the benefits of water-based activity for those with arthritis, and to raise funds for The Arthritis Society. The event takes place in pools across the country from April 20 – 23, 2006 . It will be held in Valley East on April 21 from 9 a.m. to noon. Christine Brosseau, on the right in the photo, will be one of the swimmers participating in the event at the Howard Armstrong Recreation Centre in Valley East . 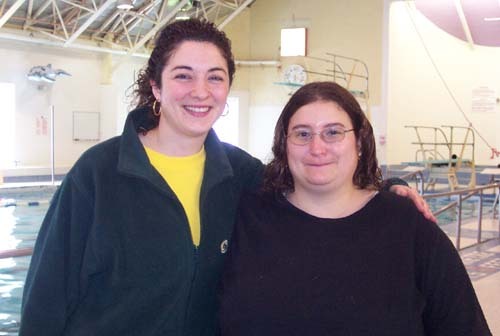 She is shown with Anne Gervais, Facility Pool Operator. Anne, who was instrumental in making the arrangements to have her pool involved in the event, invites people of all ages and physical abilities to participate in the Foresters BIG Swim and help raise funds for the Arthritis Society. The event includes distance swims, aquafit and aqua “fun” for children, all designed to inspire Canadians to engage in water-based exercise. For people who have arthritis, swimming and water-based activity is one of the best ways of exercising and maintaining a good physical fitness level. The Howard Armstrong Recreation Centre offers a Pool Therapy Class every Tuesday and Thursday from 2 to 3 p.m. where people with arthritis can participate in an instructor-lead program of swimming and exercise. 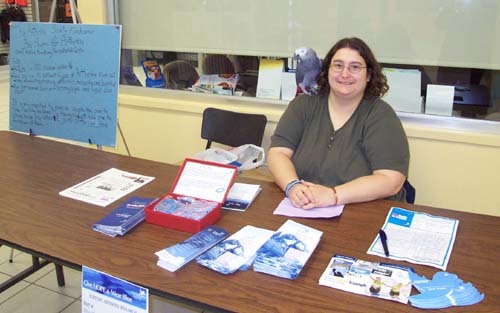 Christine, who is a victim of rheumatoid arthritis, began swimming two years ago. She can often be found in the pool several hours a day, taking advantage of adult swims and public swimming sessions. Her goal is to complete the 5000 meters necessary to receive a “Gold Medal” at the Foresters BIG Swim event. That will require her to swim 200 laps of the pool in about three hours. She now swims between 60 and 100 laps a day and is “training” for the big day on April 22. The best she has ever done to date is 2000 laps over a 17 day period. Christine will be at the Hanmer Valley Shopping Centre every Saturday between now and the BIG event, seeking sponsorship donations and providing information and inspiration to people interested in helping the Arthritis Society. All residents are encouraged to provide Christine with a couple of dollars in an effort to make life a bit better for the many people in our society who are affected by this disease. We all wish Christine the best of luck in achieving her “Gold Medal”. In the above photo, Christine and Sammy, spent many Saturdays in the mall collecting pledges and providing information about the arthritis society to hundreds of shoppers.